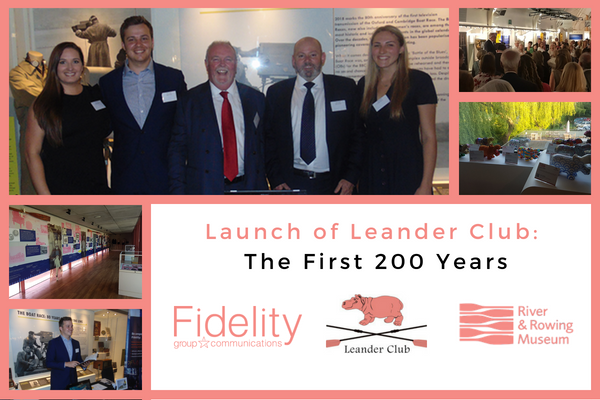 Fidelity Group sponsored and attended Leander Club’s VIP preview and launch of the Leander Club: The First 200 Years exhibition at the River and Rowing Museum in Henley-on-Thames on Tuesday 22 May. Leander Club has been a customer of Fidelity Group for over 5 years, with provision of all connectivity solutions including data circuits, wi-fi networks, analogue lines and IT services by Fidelity. Leander delivers rowing athletes for Team GB. Twelve Leander athletes won medals in the Rio Olympics (out of GB’s total of 26), retaining GB’s position at the top of the rowing medal table. Leander Club boasts an impressive 124 Olympic medals and 3 Paralympic medals. The club has had unprecedented success at the World and European Championships as well as the Henley Royal Regatta, with all 199 wins. We are sure they are working hard towards the goal of a 200th win at the HRR this year, during the club’s bicentenary. The exhibition, Leander Club: The First 200 Years, is a collaboration between the River and Rowing Museum and Leander Club. Treasures from the Club’s private collection and the Museum’s archives have been brought out to explore Leander’s rich history and the performance athletes who have made this the most successful rowing club in the world. The River and Rowing Museum has also been a customer of Fidelity Group for 4 years. Fidelity Group supply all data and comms for the museum. Hugh Richardson, Chair of Leander Club made a speech thanking the River & Rowing Museum for hosting the exhibition. He said, “We are very much blessed in Henley to have this wonderful museum which is celebrating its 20th anniversary this year. Leander is particularly privileged to be recognised with a special exhibition to mark its first 200 years. Part of the good fortune of being a member of Leander is to honour its splendid heritage as we are merely the custodians of a remarkable tradition which has enjoyed both periods of great success and periods when we were not always in the pink! The exhibition launch also featured 200 hippos (the Leander mascot featured in their logo) which had been decorated by Olympic rowers, local celebrities, businesses, school children, community group members and artists to mark and celebrate Leander’s Club bicentenary year. Most of the hippos have been entered into an auction via Leander Club website for people to bid on. Money raised from the auction will go The Kafue River & Rowing Centre which Leander Club has been supporting for the last 3 years. The centre is being built south of Lusaka in Zambia as a centre for clean water research, education and to develop the sport of rowing. The closing date for bids is the 16 September. The community initiative, Hip-Hip-Hooray, can be viewed for one day only next Tuesday (30 May) at the River & Rowing Museum between 10.00 – 5.00pm in the Thames Room.